If you've got a few hours to spare, tour the Iwahig Prison! We went there on our last day since we needed something to do before our late afternoon flight. Iwahig Prison is where you'll see inmates working in the fields or guiding tourists around the area. You'll see the oldest building in Puerto Princesa here. At the time, all flags were at half mast to mourn the death of late DILG Secretary Jesse Robredo. During the Spanish era, Puerto Princesa was the place of exile for people who were sentenced to banishment. In the early 1900's, the penal colony was established. Until now, it serves as a prison to accommodate overcrowding in the Bilibid prison in Muntinlupa. If offenders are fit to work, then they're sent to Iwahig without a choice. Huge open fields are well maintained. Some of the inmates taking a break from field work. This was part of medium security, if I'm not mistaken. Pretty safe, if you ask me. Upon your arrival, ask to be dropped off at the security office so you can request for a guided tour around the compound. A stay-out inmate from minimum security will tour you around. It's free. We were welcomed by Mr. Puno in the security office. He gave us a brief history and overview of Iwahig. Here, inmates serving their sentences are slowly prepared for life back in society. This is what I like most about the place. Inmates don't just bum around like in other prisons. They work in the fields, create souvenirs to sell, act as tour guides, and do admin work in the office. I remember watching Shawshank Redemption where a guy commits suicide after being freed. It was too difficult to integrate himself back into the community. Iwahig tries to avoid this, I guess. The guided tour was very safe. Michael toured us around the compound for a few minutes and he answered all our questions. Our guide for the afternoon was Michael (not his real name). He's a stay-out inmate in minimum security. Michael is from Davao and is serving time due to homicide, if I heard it right. His sentence ends next February... not unless he commits another offense. Here are some of the places we saw in Iwahig, which were all walking distances from one another. The recreation hall is the oldest building in Puerto Princesa. 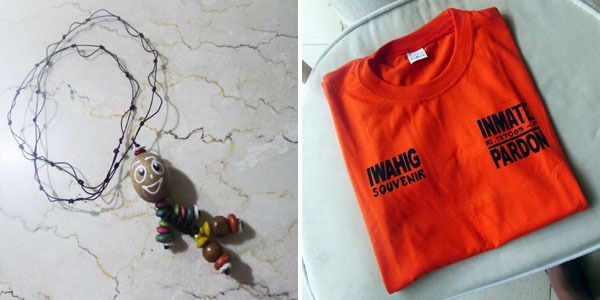 Souvenirs here are mostly made by inmates. Some of the proceeds go to them! Dancing inmates perform for the guests! Have your picture taken outside the recreation hall! Inmates off to do some work. Did you know that there used to be a bowling alley inside? Tennis court! I don't think it's being used anymore. Part of medium security, I think. Although the guided tour is safe, I admit feeling uneasy inside just because it was a prison and a prisoner was giving us the tour. I felt a lot better (and safer) knowing that friends were with me—even if we were an all-girl group. Hehe. Travelers can take the multi-cab going straight to Iwahig Prison for Php 50. A multi-cab outside the LTO office in Valencia St. departs every two hours. We rode the 10am trip. It's around an hour's drive. It was a tight squeeze inside because the driver had to pick up and deliver boxed goods to Iwahig. Travelers can take the multi-cab going straight to Iwahig Prison for Php 50. As of posting, this bridge near Iwahig was still under repair. We had to get off the multi-cab, walk a bit, and meet the multi-cab on the other side to ride again. 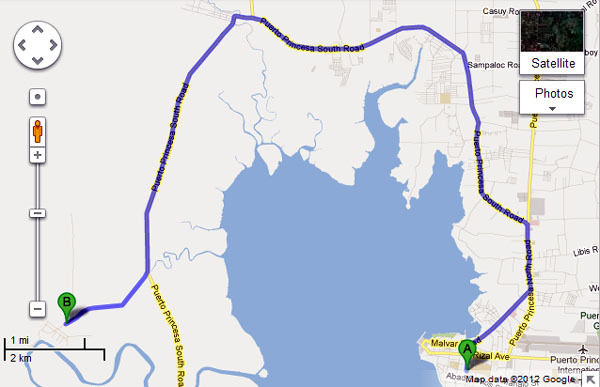 The ride from Valencia St., to Iwahig Prison takes more or less an hour. What do you think about the system in Iwahig? Very informative article. Just one thing: I haven't seen the Shawshank Redemption yet and was planning on watching it soon. Hopefully that's not too big a spoiler. How many prisoners are there? Are the guards armed with guns? Not sure about exact numbers... but I'm guessing more than a thousand? PS. Apologies for the extra late reply.